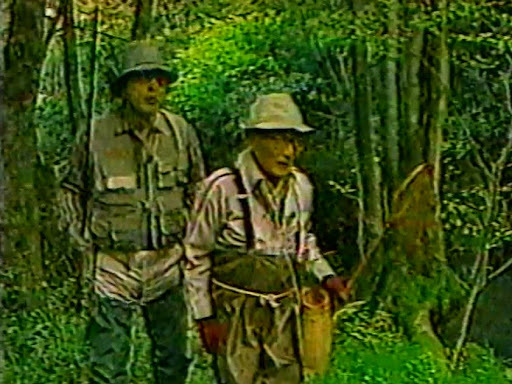 has anybody further information about the japanese fishing baskets? Interesting is the round opening on the top. Are there any better pictures of this baskets? I remember one picture which I can´t find anymore which shows a wooden frame to hold the basket. Do you have the original link to the pictures you posted? 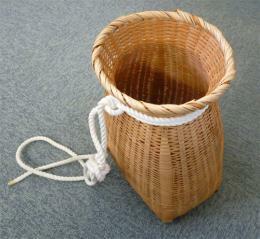 I ask because it may provide the actual Japanse term used for the name of the baskets. I found these links, not sure if they are the same thing or just something similar. These are shaped with rectangular bottom, translates as “ fish cage for the back”. Searching on the above terms turns up a lot of similar baskets which are marketed or listed as a basket for home flower arrangements or as a basket to use when gathering wild foods, mushrooms, etc. Better would be to find what they were called in the original images you found, if the baskets were commented about. Anyway, a fun search. All I could find with a quick look. Maybe the same, maybe not. Many thanks for your search. The baskets in the links look very intersting. The pictures were made by Daniel, the first one is a screenshot from TV, the second is the Sanpei Comic which David got from Dr. Ishigaki. Yes they are Japanese Creels. Many shapes and sizes over here. The top end ones have hammered copper as reenforcement. The tiger part is the type of bamboo "tora take" because of the pattern on the bamboo. Most are now inported from China but the top end ones you see on one of the sites is still made in Japan. I believe the different shapes and sizes just evloved depending on whom and where they were made. A little town in Nagano known for basket making has some very cool shapes and sizes. We would add wet grass to the bottem of them first then add the fish we caught. They would really keep your fish cool. Wisdom from the past. Sorry met to post this else where.